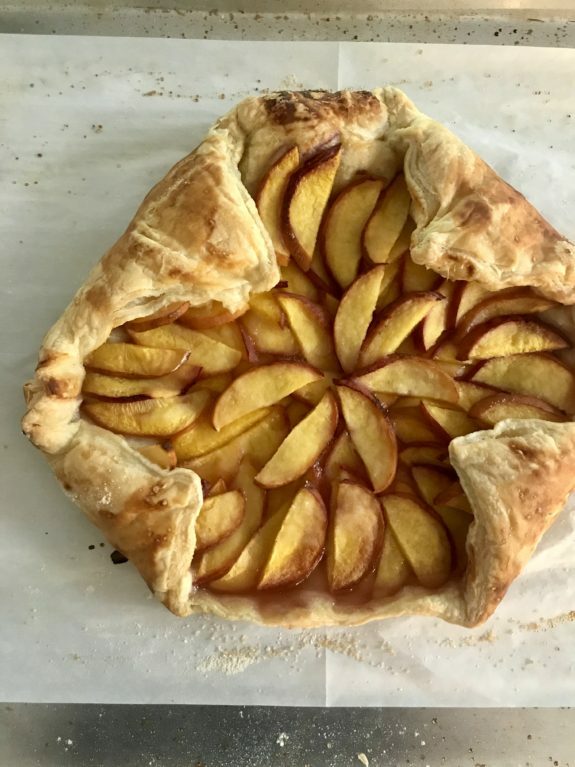 There is this peach galette that I keep on making. I made one yesterday and I still have peaches so I think I will make another one today. It’s shockingly simple. I forego the process of pulling together a homemade crust and buy a sheet of puff pastry instead. I cut up some peaches, cutting around the pit in quartered sections and then slicing each chunk into thin (but not too thin) slices. You can toss them in flour but you don’t need to. I don’t. I roll out my puff pastry and don’t give a second thought to its shape. I was trying to make a square piece round the first time I did it but then realized that the rough edges and asymmetrical shape are what make it a galette and not a pie. This is the step that takes me the most time. I create a pattern with my peach slices. Starting from the inside, I work my way out in a circle of peach slices that looks like a star in some ways and a trippy kaleidoscope in others. Sometimes it looks prettier than other times. But every time, it calms me. I slowly make my pattern, taking my time and trying something new with each galette. I lay out my slices, one by one. My fingers get a little sticky and I marvel at the beauty of a few slices of fresh peach in the natural light coming in through the window. At the summer heat in the air. At the music playing on the speaker nearby and the kids playing outside and the dog lapping up her water from the bowl down the hall. That part takes the most time. With good reason. I sprinkle on a little brown sugar. Peaches are so sweet on their own these days that you almost don’t need it, but I like the way it caramelizes and adds a little depth to the color and taste of the fruit. Just a little. Not too much. I fold up my corners. I think twice about how imperfect they are and leave them that way, nonetheless. One is bigger than the other. One stuck to the board so it’s pulled together in a stringy, sticky mess. But it doesn’t matter. Puff pastry is very forgiving once it’s baked into a golden, flaky crown. I brush the outer edges with a little milk (easier than wasting an egg for an egg wash – thank Gwyneth Paltrow for teaching me that one). I heat the oven. Wonder why I have the oven on in 80 degree heat. And the peaches are perfect. Even if the galette isn’t.